Carte de visite of Confederate General Arnold Elzey (1816-1871) with Anthony backmark. Fine condition. Arnold Elzey Jones Jr. (1816- 1871), known for much of his life simply as Arnold Elzey, was a soldier in both the United States Army and the Confederate Army, serving as a major general in the American Civil War. 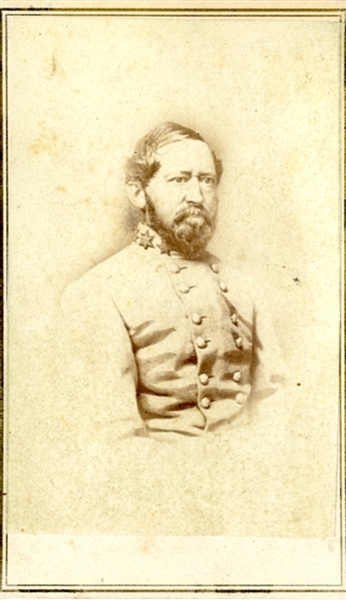 At First Manassas, he became one of the few officers ever to receive an on-the-field promotion to general by President Jefferson Davis. He commanded a brigade in Stonewall Jackson’s Valley Campaign, and was badly wounded at Gaines Mill, ending his active field career.